Chinese President Xi Jinping, bottom row center, speaks during a conference to commemorate the 40th anniversary of China's Reform and Opening Up policy at the Great Hall of the People in Beijing (Dec. 18, 2018). Xi’s major takeaway, according to a public speech celebrating reform and opening, is that the CCP is perfect. 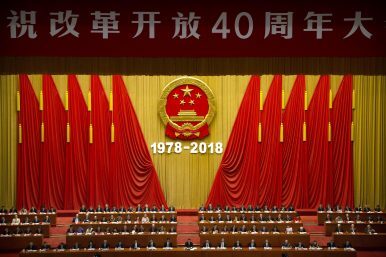 December 18 marked the 40th anniversary of China’s “reform and opening” policy, which was inaugurated at the Third Plenum of the 11th Central Committee of the Chinese Communist Party (CCP), held December 18 to 22, 1978. The entire year has seen a number of events and exhibitions celebrating the anniversary, which effectively gave birth to “socialism with Chinese characteristics.” All the previous festivities were leading up to the anniversary proper, where President and CCP General Secretary Xi Jinping was expected to give a speech outlining not only the past but the future of China’s economic reforms. Ahead of December 18, there was a wave of guarded optimism overseas about Xi’s speech. The thaw in the U.S.-China trade war is holding, and China made good on promises to lower tariffs on U.S. automobiles and agricultural products. Yet those are temporary fixes that don’t address U.S. concerns about the very structure of the Chinese economy, in which the CCP and its state apparatus play a huge role. Accordingly, some China experts thought that Xi might take the opportunity of the anniversary celebration to embrace a more ambitious reform agenda – without appearing to bow to U.S. pressure. At the risk of sounding naive, is it possible that we are close to another significant turning point in PRC history? Will Xi finally make significant steps to fulfill the reform promises of the 2013 Third Plenum as well as promises he is likely to make later this month as part of the anniversary commemorations? … Any shift to deeper economic reforms will not address the growing contradiction of the central state-owned enterprises, the encroachment of the party back into all aspects of life, nor would it lessen the focus on technological self-reliance. But even a return to a messy and imperfect implementation of deeper reforms might still unleash a lot of economic activity, innovation, and value creation. Xi’s speech emphasized the radical transformation China has gone through in the past 40 years. In 1978, he noted, people struggled to even have adequate food and clothing – by 2017, after enjoying an average of 9.5 percent annual growth since 1978, the poverty rate had dropped by an astounding 740 million people. Unswervingly consolidate and develop the public [state-owned] economy; unswervingly encourage, support, and guide the development of the non-public economy; fully display the decisive role of the market in allocating resources; make better use of the government’s role; and stimulate the energy of all parts of the market. If that sounds familiar, it should; the CCP made those same pledges back in 2013, after the Third Plenum of the 18th Central Committee. Five years on, critics say there has been little to no progress on increasing the role of market forces in China’s economy, or boosting the private sector. Ultimately, Xi’s speech might best be summed up in a quote from Xinhua’s English-language coverage: “We will resolutely reform what should and can be reformed, and make no change where there should not and can not be any reform.” Xi’s list of what “should not and can not” be reformed is quite lengthy, and apparently includes any lessening of the CCP’s dominant role in the economy. The real winners of the 2013 Third Plenum are Xi Jinping and the Chinese Communist Party.